Study verifies long-standing hypothesis that glutamate is brain’s energy-source. Glutamate is an amino acid with very different functions. In the pancreas, it modulates the activity of the pancreatic ß-cells responsible for insulin production, whereas in the brain it is the main excitatory neurotransmitter. In recent years, it has been suspected to play an additional role in the functioning of the brain. In the brain, glutamate is predominantly derived from glucose catabolism and subsequent TCA cycle metabolism. The latter provides substrates for glutamate dehydrogenase (GDH), an essential enzyme connecting glucose and glutamate metabolism. In the CNS, glutamate dehydrogenase is predominantly expressed in astrocytes, an alternative pathway to glutamate-glutamine cycling that provides neurotransmitter precursors for glutamatergic neurons. Therefore, it has long been theorised that the brain uses the excitory neurotransmitter glutamate as a source of energy. Now, a study from researchers at the University of Geneva (UNIGE) has verified that the brain uses glutamate to produce energy and has highlighted unexpected links with the rest of the body. The opensource study is published in the journal Cell Reports. Previous studies show that unlike other organs, the brain cannot draw its energy from lipids, an energy resource widely present in the body. The blood-brain barrier, which protects it from the pathogens and toxins circulating in the blood, indeed limits the passage of these lipids. Moreover, while most of the organs in the human body have the ability to store glucose by increasing their mass, the brain cannot count on these variations in volume. Unable to store its food, the brain depends on sugar supplied in real-time by the rest of the body, whose distribution of energy is controlled by the liver. Glutamate is the most abundant excitatory neurotransmitter and, besides glucose, may also contribute to sustain brain energy homeostasis. As glutamate can be oxidized by astrocytes at higher rate than glucose, the group decided to verify if glutamate was indeed an energy source for the brain. The current study analyzed the role of the glutamate dehydrogenase enzyme, which is encoded by the Glud1 gene and responsible for glutamate metabolism in the brain. The lab suppressed the Glud1 gene in the brain of mice and found that in the absence of glutamate dehydrogenase the brain was no longer able to convert glutamate into energy, even though the amino acid was present in the brain. Results show that when the brain is devoid of the energy supplied by cerebral glutamate, it sends signals to the liver to acquire glucose, at the expense of the rest of the body. Data findings also show that the transgenic mice showed a growth deficit and muscle atrophy due to this ‘acquiring’ of glucose from the rest of the body. The team state that this clearly shows how the brain works in a just-in-time manner and that each percent of energy resources is essential for its proper functioning. They go on to add that if part of this energy disappears, the brain serves itself first and the rest of the body suffers. Results show that the liver must then make more glucose by drawing upon muscle protein, resulting in loss of muscle mass. The group conclude that knowing that the brain uses glutamate as an energy resource allows researchers to reflect on other ways to overcome a potential shortfall. The team surmise that in mutant form the glutamate dehydrogenase enzyme is responsible for a congenital hyperinsulinism syndrome, a severe disease affecting the endocrine pancreas, the liver and the brain. They go on to add that individuals affected by this syndrome suffer from intellectual disability and have a high risk of epilepsy, and that the global medical community also suspect a correlation between the Glud1 gene and schizophrenia. For the future, the researchers are introducing in mice the same Glud1 mutation detected in epileptic patients and will also be assessing how schizophrenic patients brain’s use glutamate. Glucose, the main energy substrate used in the CNS, is continuously supplied by the periphery. Glutamate, the major excitatory neurotransmitter, is foreseen as a complementary energy contributor in the brain. In particular, astrocytes actively take up glutamate and may use it through oxidative glutamate dehydrogenase (GDH) activity. Here, we investigated the significance of glutamate as energy substrate for the brain. Upon glutamate exposure, astrocytes generated ATP in a GDH-dependent way. 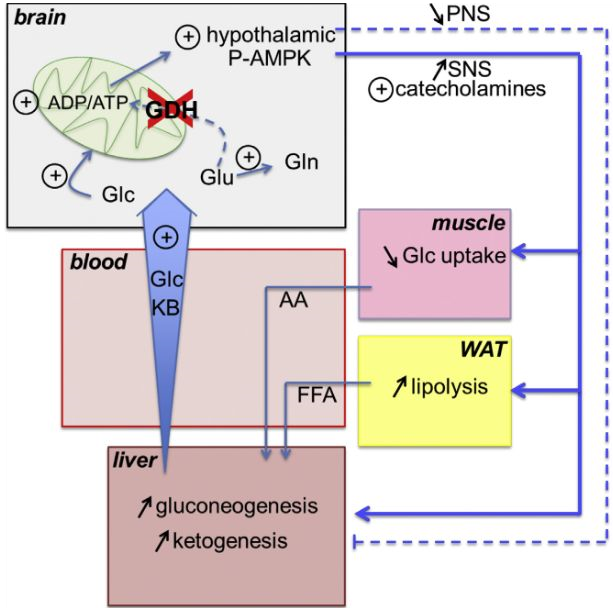 The observed lack of glutamate oxidation in brain-specific GDH null CnsGlud1−/− mice resulted in a central energy-deprivation state with increased ADP/ATP ratios and phospho-AMPK in the hypothalamus. This induced changes in the autonomous nervous system balance, with increased sympathetic activity promoting hepatic glucose production and mobilization of substrates reshaping peripheral energy stores. Our data reveal the importance of glutamate as necessary energy substrate for the brain and the role of central GDH in the regulation of whole-body energy homeostasis. GDH-Dependent Glutamate Oxidation in the Brain Dictates Peripheral Energy Substrate Distribution. Maechler et al 2015.